I opened this book with a true sense of wonderment. I mean, what a mighty picture-book pairing this is. 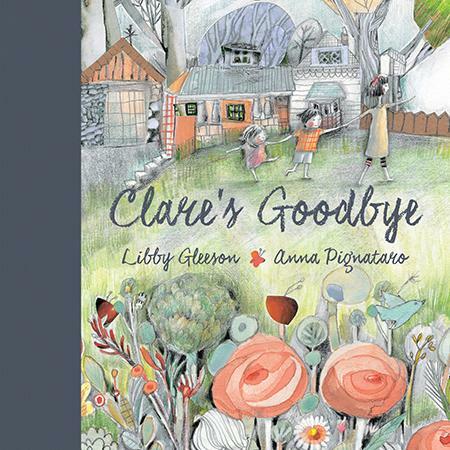 Libby Gleeson and Anna Pignataro, two masters of beauty and poignancy, have treated us to an evocative journey through the world of three siblings saying goodbye to their old home. It is moving day and as Rosie and Jacob farewell all the favourite, comforting aspects of their old home - the tree house, their pet bunny's grave, the sandpit - little Clare sits sad and folorn on the back step, refusing to join them. Gleeson's sparse text and thoughtful details capture the heartache of the children at leaving their home, their sense of loss and nervous anticipation. This emotion is beautifully enhanced by Pignataro's stirring illustrations; an exquisite, textured blend of paint and collage. Muted tones and shadows portray an emptiness and air of melancholy in the children's world, giving way to the colour and chaos of the grown-ups' world. The colour builds gently as the siblings search for Clare and then softens and shines when they discover and join her, dancing, in their old bedroom. This is a precious book about saying goodbye. It's also about acceptance. Not just of change, but of sadness and how each of us deals with it in our unique way.